We went to see Rasheeda Speaking because I love The New Group. The company has never failed me. Seeing The New Group production of Hurlyburly in 2005 (with the banging-good cast of Bobby Cannavale, Josh Hamilton, Ethan Hawke, Catherine Kellner, Parker Posey, Wallace Shawn, and Halley Wegryn Gross) in 2005 remains one of the most memorable theatre experiences of my lifetime. Getting a last minute ticket to the completely-sold-out show by standing at the doorway and asking people to sell me one of theirs actually worked. And I am pretty sure I bought my ticket—at face value—from, and sat with, Ellen Barkin. So, when we decided to travel to NY in Feb, I checked to see what The New Group had going.The casting and director and synopsis for Rasheeda Speaking looked promising. 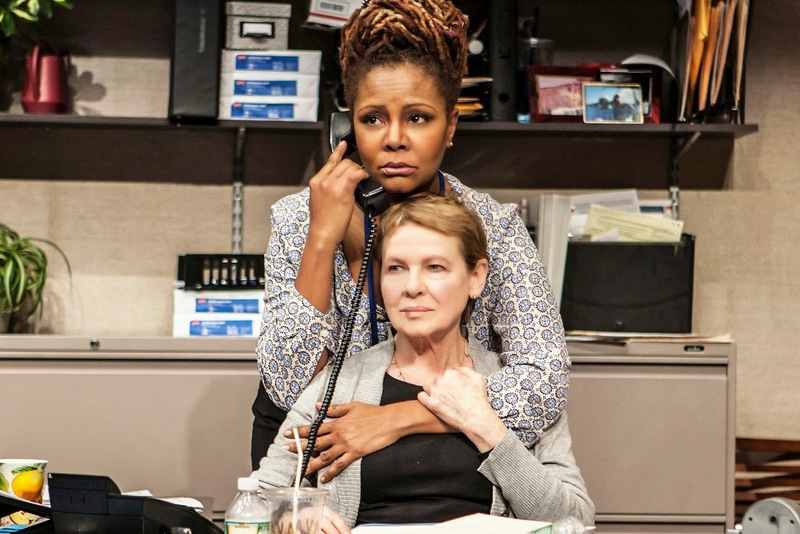 Cynthia Nixon directs this tense workplace thriller by Joel Drake Johnson, examining the realities of so-called “post-racial” America. 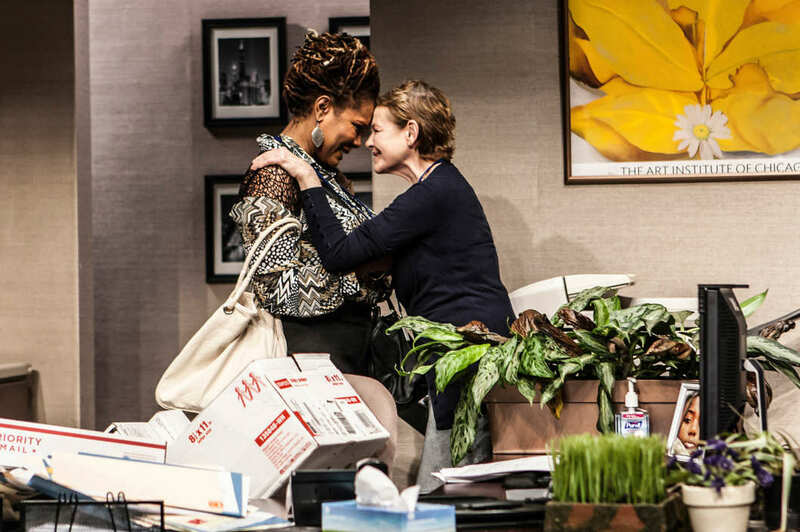 Dianne Wiest and Tonya Pinkins star as co-workers who are driven apart by the machinations of their boss. A chilling power struggle ensues that spins wildly out of control. Rasheeda Speaking is an incisive and shocking dark comedy that keeps you in its claustrophobic grip until its final moment. Also featuring Patricia Conolly and Darren Goldstein. We were headed to NYC while the show was still in previews, so we had no reviews to consider. No matter. A completely gripping 100 minutes left me in tears and audience members on their feet. This felt like a pretty genuine tale of subtle racism, unconscious racism, tentative friendship (or friendliness anyway) between races gone awry, and even blatant racism—albeit perhaps with some dementia. This seemed a perfect play to encourage even those of us who believe we are mostly beyond all that (and wish everyone else would just catch up) to remember that we are all racists. That it's impossible really not to be so. The experience is not going to appeal to everyone, for sure. But this was an audience of people who came—on purpose—to see a play about racism in the workplace. Many would reject the idea as too hard, not fun, old hat even. For those of us who are open to considering how very vigilant we have to be about our own privilege and anger, it's an elegant starting point for a real conversation about race. I've never wished more for a talkback session at the end of a play. The New Group is hosting several, just not on the day we were there. I wanted so much to hear what other members of the diverse audience thought of it. Did the black audience members react at all as I did? Was it as real for them? What did the actors feel about their character and her actions? I told my friends in NY to buy tickets before word got out about this terrific show, before the reviews. It was a shock then to read the NYTimes review of Rasheeda Speaking a few days later. Charles Isherwood likes the acting, and the dialogue. But he thinks that it's just not very real. And that perhaps the playwright is trying too hard to be provocative about race. But the characters’ behavior is often so erratic, and occasionally incredible, that you begin to suspect the playwright is more interested in stirring troubling thoughts about racism than in truthfully exploring a complicated subject. During a later visit, Jaclyn apologizes to Rose for her unwelcoming behavior. Rose accepts the apology and offers a preposterous response. “My son thinks it’s in your culture to act the way you did,” she says. “Something about your way to get revenge for slavery.” While it is conceivable that an older Chicagoan might have such thoughts (or a son who does), we can conclude from Rose’s voicing them only that she’s a nitwit, and, yes, a racist. The fine acting cannot always paper over the implausibility. There is certainly something provocative in Mr. Johnson’s desire to infuse a social-issue play with the dynamics of a psychological thriller, as he attempts here, but with a subject as sensitive as the issue of race in America, a more probing and less sensational approach is not just advisable, but necessary. This review shocked me. Isherwood is a white man. I don't know him. But his review certainly reads like that of someone who saw the show through privileged lenses. It reminded me of hearing white, well-off neighbors say that they don't judge anyone by race, and don't expect to be judged that way by others. Easy for you to say. There are currently 22 comments on the review. Roughly half of the commenters seem to have had a reaction similar to mine, and most of these are now voted up as readers picks. See, this is the problem when the roster of theatre critics is so overwhelming white. Someone writes something like this: "Rose accepts the apology and offers a preposterous response. “My son thinks it’s in your culture to act the way you did,” she says. “Something about your way to get revenge for slavery.” If Charles Isherwood were black, he wouldn't feel that that response was preposterous. I've heard it several days in my life. He is utterly unqualified to make a preemptive determination that white people don't say preposterous things, like ...your way to get revenge for slavery. Walk in my shoes, Charles. Walk in my shoes. Mr. Isherwood should listen to my 73 year old friend describe taking the Metro North to CT with her daughter to spend last Christmas Eve with her son and his family. Only two empty seats, both commandeered by women, one white, one Asian, for their packages. Both refused to clear off the seats for my African American friends until a conductor came along and ordered them to do so. The seeming banality of racism experienced every day. Ms. Pinkins said in a recent NYT interview that she experiences it every day of her life. Her partner, a white former cop, doesn't believe her. Or at least he didn't: he should see this remarkable play, acted beautifully. It is the stuff of psychological thrillers, Mr. Isherwood, as real life can be if we're paying attention. While Mr. Isherwood saw the play, I'm not sure he sees the world. Or, rather, he sees a white man's world. I saw the play recently. Immediately after, I overheard a group of black women in the lobby talking passionately about how accurately the playwright captures the experience of black women in professional situations. And Mr. Isherwood's surprise at a woman of Ms. Saunders age making the statement she did about slavery demonstrates a white man's blindness to the real experiences of black people in America. Mr. Isherwood's review unwittingly proves the point, importance and truth of Mr. Johnson's play. I'd like to see this play produced all over the country. It's engaging and thriller-like, and disturbing and thought-provoking. I mean: it's memorable. It makes you love theatre. It makes you want to talk with strangers in the audience. It stays with you. It's painful, but it still makes you feel happy because it's so good. And it's about something we all need to consider. I'd like for this play to start new conversations in communities. Could a so-so, even dismissive, Times review prevent that from happening? This post is my small way of putting a pebble on the other side of the scale. Writing about race, or even about any play in this way, is a big departure for me. But Rasheeda Speaking at The New Group moved me to do it. More of a cobble than a pebble, Ms. Waller. Good start.